Readers discuss suspended animation and administrative costs. 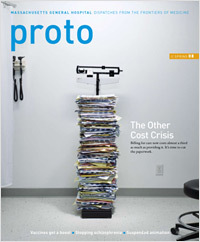 The recent work of Mark Roth and his colleagues at the Fred Hutchinson Cancer Center and of Warren Zapol and his research team at the Massachusetts General Hospital, reported in the Spring 2008 issue of Proto (“Dying to Live”), provides compelling data on the use of hydrogen sulfide to induce suspended animation in animals and to protect human organs during shock and surgical procedures. What the article missed is that these elegant studies provide a strong foundation for investigating the potential protective effects of hydrogen sulfide in certain disease states. Although hydrogen sulfide was once denigrated as a toxic, foul-smelling gas, the recent explosion in research efforts to define the gas’s potential protective effects will likely change that perception. It is clear that this work is still in its infancy and will provide many years of exciting opportunities. Thank you for your story about the rising pressures of administrative costs (“Trouble in Triplicate,” Spring 2008). As a practicing physician, I’ve personally had to bear the burden of such costs, paying out about 25% of my annual billings to a medical service organization that handled these matters for the practice to which I belonged. As president of the Colorado Medical Society and the state’s Blue Ribbon Commission for Health Care Reform, I’ve worked with my colleagues and other health care professionals to seek solutions. Over the past few years, the commission has identified a number of strategies for simplifying and streamlining administrative processes, ones that could save our state’s physicians an estimated $118.7 million and our hospitals $48.5 million. These solutions include the standardization of contracting, claims and health plan cards. We completed a long, lively negotiation to simplify our contracts with health plans; in fact, Colorado became the first state to pass a law requiring that provider contracts be drafted in plain language with a standard set of terms. And because the commission is advocating that all state residents be covered by health insurance, we’re striving to address up front the need to drive costs down. Based on my experiences, I’m optimistic that the health care industry can overcome the hurdles of lowering administrative costs nationwide, but I also recognize that many of the necessary steps will require strong leadership and gradual implementation. The world of medical apps is still imperfect, these physician-bloggers say.